Those materials are suitable for the horizontal traveled focal plane shutters like Leica, Exakta, etc. 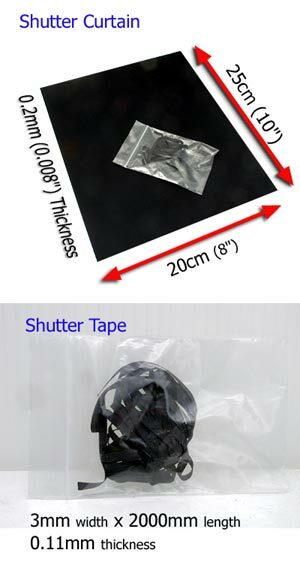 Shutter tape is also suitable for repairing old Contax cameras' shutter tape. Pinhole checked by factory, you can be assured to use this Curtain. Please Click HERE to find the basic guide page to make shutter unit (for horizontal traveled focal plane shutters). Sizes are not very accurate. ex) approximately 15cm x approximately 120cm (probably 16cm x 121cm).